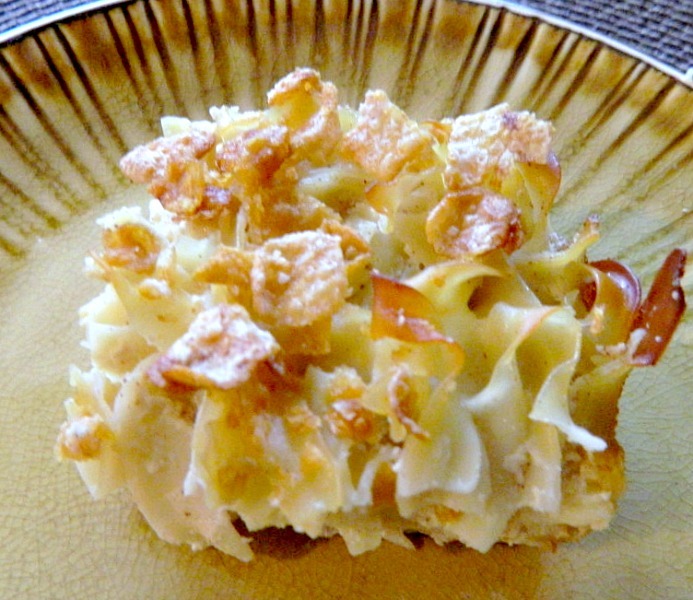 For a delicious lower fat version of a traditional “Noodle Pudding/Kugel” You must try this recipe. It’s so good, no one in my family knew it was lower in fat and calories when it was served. Enjoy every creamy, noodle bite! My mom Ruth always made a delicious noodle pudding (we call it kugel). I grew up loving this very sweet, very fattening dish. She used lots of butter, full fat sour cream and 7 whole eggs in her recipe! I have modified my mom’s recipe and cut out most of the fat and a lot of the calories. The first time she tried my recipe she couldn’t believe how much she enjoyed my skinny version. I was so happy. Now whenever I have a holiday party in my home, I make my version and no one even knows it’s low fat and raves about it (shhh). I hope you all enjoy this version as much as my family and friends. Boil noodles for 8 minutes in salted water. In the meantime, whisk together the eggs, egg whites, milk, sour cream, orange or lemon juice, vanilla, cinnamon, nutmeg and salt. Drain the noodles and save about 1/8 cup of the cooking liquid. Spray a 13 x 9 baking pan (preferably a glass pan) with cooking spray. Pour the noodles in the baking pan and pour the reserved cooking water over the noodles. Mix gently. Now pour the egg mixture over the noodles and mix gently again to coat all the noodles. Pat down to push the noodles in the liquid and to even them out. Sprinkle the Frosted flakes over the pudding. 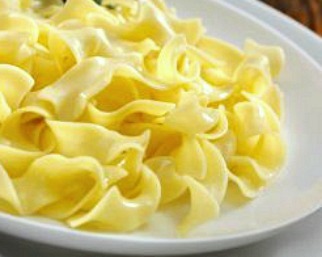 Pour 2 tablespoon melted butter over the noodles right before they go in the oven. Bake for about 45-55 minutes. Half way through baking, turn the pudding around. Start checking the pudding after 45 minutes. Note: This tastes really good fresh from the oven but it even tastes better if you bake it and then let it cool and reheat it later on. It will cut much easier too. ENJOY!